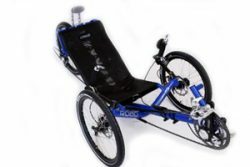 Catrike makes several models of Recumbent Tadpole Trikes and they are all made in the USA. The Catrike trikes are some of the best values around. From the easy-to-get-used-to “Villager” up to their low-slung, high-performance “700”; they are all good at the type of riding they were designed for. The Catrikes with an integrated seat/frame design are a few pounds lighter than their competitors. One after another of the Catrike models have won the prestigious BROL trike of the year award in 2003; 2004; 2005; 2006; 2007, 2008 and 2011! We have been a Catrike Gold level dealer for over a decade, so we are pretty familiar with their models. Come to Bicycle Man and try and wide variety of Catrikes and other recumbent trikes! One of the things I like about Catrike is that they stick to their strengths. Paulo Camasmie designs simple, light, responsive, aluminum trikes. Then he designs his own tooling and builds them efficiently in his own Florida factory. He doesn’t build a prototype here and then import his production models. 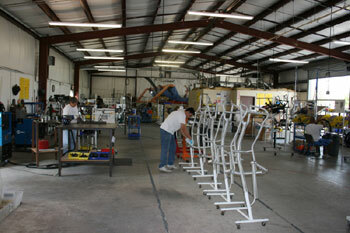 They all have aluminum frames designed, cut, formed, machined, welded, heat-treated and painted in Florida. American manufacturing can compete when you have a strong team that is willing to put the effort into it. All are Tadpole trikes with two front wheels and one rear wheel. All Catrikes are similarly light, from 29 to 43 lb. All Catrikes have direct steering. All Catrikes have mechanical disk brakes, one on each front wheel. All Catrikes have 30 speeds with SRAM front and rear derailleurs. All Catrikes have little or no brake-steer, less than some other trikes. All Catrikes have some pedal steer, more than some other trikes. I like the way the Catrike line demonstrates that US producers can compete with Taiwanese imports, at least in a niche market. 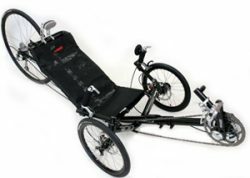 Apparently other recumbent enthusiasts like them too, a Catrike was voted ‘BentRider Trike of the Year in 2003, 2004, 2005, 2006, 2007, 2008 & 2011. I’m 6’2” with a long torso; I sometimes find the seat backs to be a bit low. At 20+ MPH a Catrike steering can be a bit touchy till you get used to it. They steer better when you relax your arms. It takes very little input to steer a direct steer trike like a Catrike. A sneeze at high speed could be exciting… I find the steering on the longer wheelbase Catrike 700 and Expedition more relaxing at higher speeds. All Catrikes come with 165 mm crank arms which I think is a good idea for most riders. Stop in for a test ride, we always have a variety of Catrikes in stock so you can try before you buy. 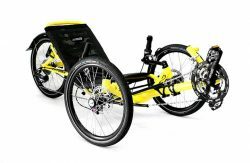 Catrike Recumbent Tadpole Trikes from the Bicycle Man ~ the State’s Largest selection of Recumbent tricycles. 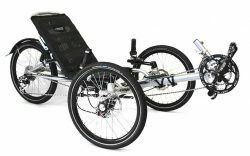 We stock trikes from Catrike including their Villager, Expedition, Pocket, Road, Dumont and Trail. Stop in for a test ride!. In our experience Catrike trikes have been more reliable than average and they have always honored their warranty without a hassle.